Blend 6 cups of fresh picked blueberries down to 4 cups of blueberries. Stir in 1/4 cup of lemon or lime juice (I used lime). Into a cup of honey add, stir and dissolve 2 tsp of pectin powder. Heat the fruit mixture to boiling and add in the honey mixture. Return the whole thing to boiling again and then fill the jars. Add the lids and the rings. Put the jars into the hot water bath and boil. 10 minutes for half pints, 20 minutes for pints. Remove the jars very carefully. I was taught to use the lid of the canning bath as a shield against any jars that may explode. Once the jars are cool, check the lids to make sure they are sucked down. Remove the rings and clean up any “urps”. I like to put the rings back on once they are clean and dry. Don’t forget to label your jars with what’s inside and the date you canned it. I have 6 pints of blueberry jam to show for all my efforts. It took me about 1 1/2 hours from start to clean kitchen. Not a bad use of time. 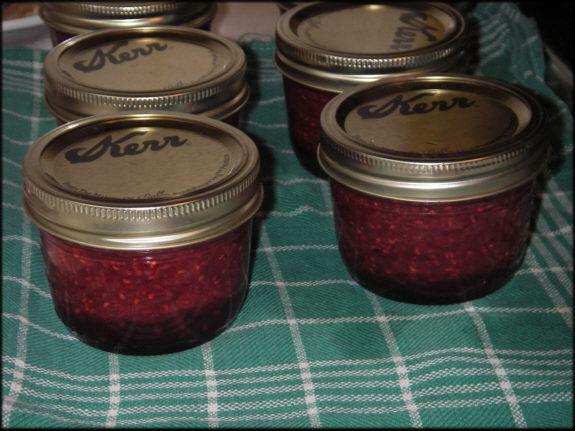 *I made a great batch of raspberry jam using almost the same recipe for the blueberries. You can omit the lemon or lime juice and I used only 2/3 cup of honey. It also worked well with a combo of raspberries, blueberries and marionberries. *I am infusing vodka with the few leftover raspberries.